MG's Magnette was produced 1954 and 1958. 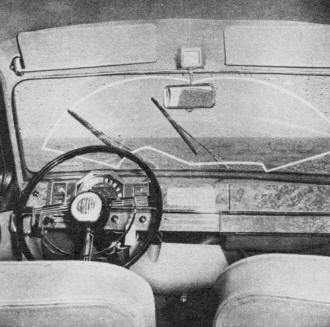 It was a fairly large, 4-door family car with rather posh features like leather seats, electric windshield wipers, safety glass, and rustproofing. The price tag of $2,675 in 1954, when this article appeared in Air Trails magazine, is equivalent to $27,148 in 2017 dollars per the BLS Inflation Calculator. 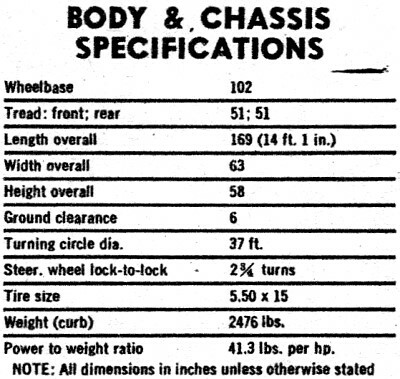 You cannot buy a car in the same class today for that amount. Modern cars are loaded with many more creature comforts and are heavily burdened with regulatory-mandated environmental and safety features that add significantly to the delivered price. Some estimates say 20-33% of a new car's price is due to regulations. 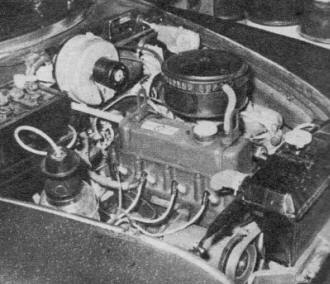 The 4-cylinder engine took 23 seconds to accelerate the MG Magnette's 2,476 pounds from 0 to 60 mph, which is very lame compared to typical times of 8-12 seconds for modern cars typically weighing a fair amount more. Short over-the-hood visibility of the Magnette (14 ft. 5 in.) is boon in crowded traffic; unlike majority .of European-front cars, fender opposite driver's seat is not visible. Body is an example of fine workmanship and finish, with just enough chrome to miss gaudi­ness. Wheels have holes for brake cooling. Driving rain during tests proved value of wiper set-up. Overlap pattern eliminates completely any blind spots in center. Unfortunately, the wipers leave about three inches of unwiped surface on either side of windshield. Rear view mirror has tilting device to eliminate glare. 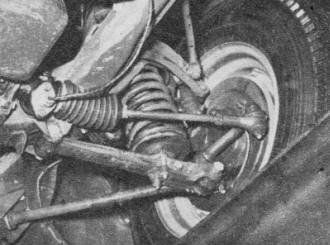 Like all modern cars Magnette has independent front suspension consisting of coil springs and hydraulic shock absorbers which, on this car, are located inside the springs. Torsion bars, diagonal lower member in picture, effectively control roll and sway, and combined with 2 3/4 lock-to-lock turns of steering wheel give the light car exceptional roadability and handling characteristics. 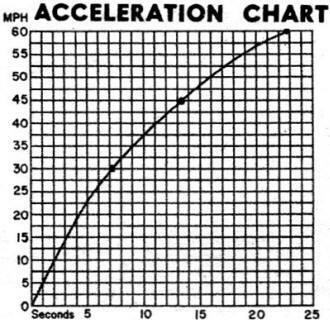 Cornering hard at 30 mph, test MG rolled not more than 4 degrees - no tire squeal. 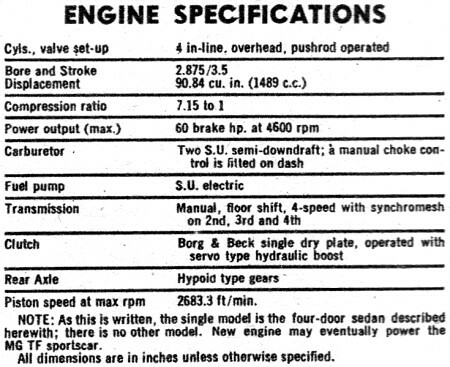 Note: As this is written, the single model is the four-door sedan described herewith; there is no other model. New engine may eventually power the MG TF sportscar. 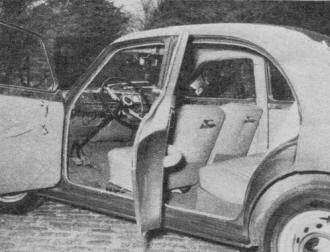 Stylewise, the Magnette shows an evident attempt by its British makers to produce a car not too foreign-looking to us. Luggage compartment is generous for a car of this size. Total width is 38", with spare wheel, available room is 28", depth 26" height 25". Car comes equipped with complete set of tools. 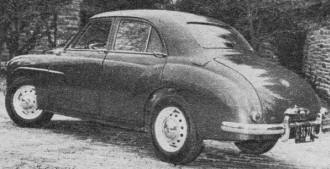 Considering its superb handling ease and excellent roadability plus the fact that price includes gas tank locking cap, electric wipers-fuel pump, triplex safety glass all around, fine leather upholstery, and rust proofing (similar to domestic Bonderite), the Magnette at $2,675 is a fair buy. It's handy to park and to garage, stops on a dime without more than the slightest trace of a nosedive, rides well without being sloppy, and couples economy with reasonably good performance. 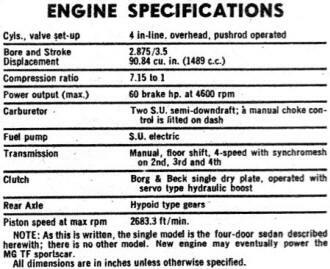 As for comfort, there's little to be desired, and the distinct note of elegance in good taste and extremely good coachwork would seem to offset the price and the only really bad point-an inadequate heater. 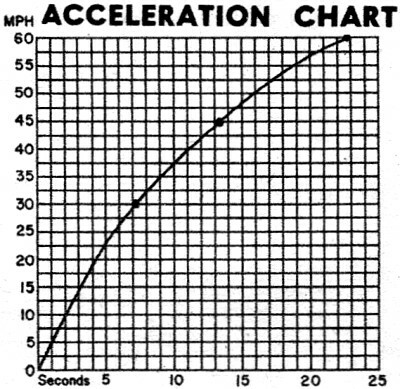 One can safely cruise the Magnette over long distances at 60 to 65 miles per hour and average a thrifty 22 to 26 miles per gallon. The fuel tank holds approximately 11 U. S. gallons. Aluminum alloy pistons, pushrod operated valves run off a three-bearing camshaft which is chain driven, and a 1 1/2 litre engine and a 3-bearing crankshaft distinguish this modern 4-cylinder powerplant which has plenty of pep for the sort of family sport and fun driving for which this car is intended. The doors stay in the open position, the engine is quiet for a four-banger, and the ladies can even learn to change a tire due to the sensible four jacking points distributed one to a corner. 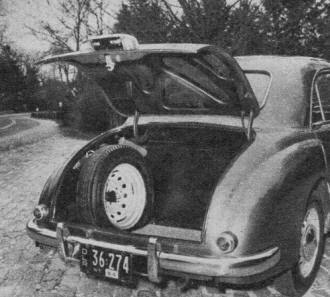 Domestic manufacturers should be able to come up with a jacking system, for with few exceptions foreign cars are so built that you can safely hoist the darn things without fearing that they'll topple over and crush the daylights out of you. The Magnette's chief appeal will be to, those who can spare three or four hundred extra dollars without feeling the pinch in order to have something that makes the neighbors give that what-is-it? look. The Magnette must be considered a car for the fun driver who doesn't mind shifting into third from top (fourth) on a long pull. On the other hand, don't let a Magnette owner talk you into a twisty impromptu race where there are hairpin turns. On such a course, the Magnette is at home. The small engine is not a copy of the familiar MG powerplant but a brand-new unit developed by BMC (British Motors Corp.) It is equipped with two S.U. carburetors. Round object by 12 V. battery is fan for heater. Jar is windshield washer tank. 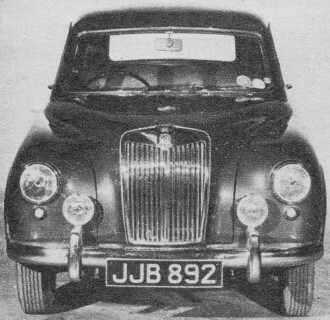 Front view shows traditional MG grille rounded out on Magnette. Extra lamps are fog lights that most cars in England use. 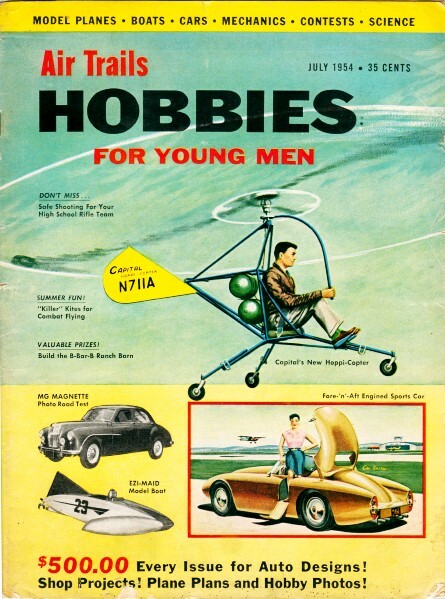 This is definitely a 4-passenger car as far as adults are concerned. Maximum leg room in driver's compartment is 42", seat is 50" wide. Maximum leg room in rear is 44", seat width 50". Armrests act as door pull. Foot pedals are pendulum mounted.